Hi, everyone! Welcome back! 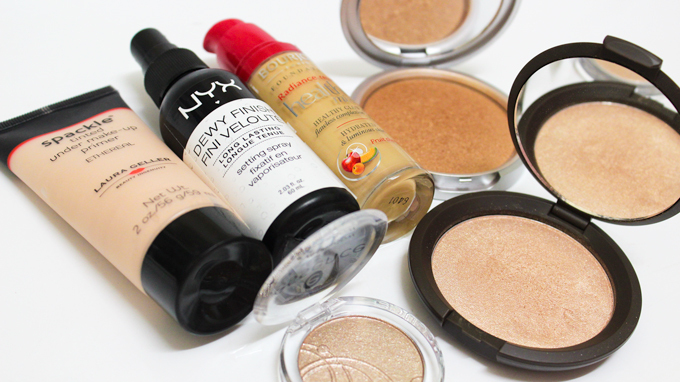 Recently I've been so obsessed with "glowing" beauty products. I've always been a fan of dewy or glowing makeup. 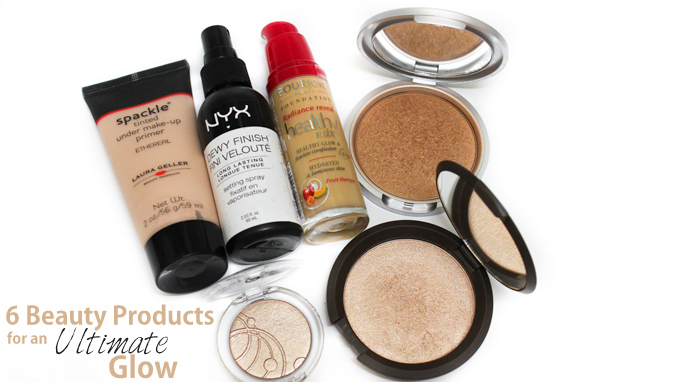 As the summer months are approaching, I felt that today's post would be appropriate if I shared some of my favorite glowing products. Enjoy! Laura Geller "Ethereal" Spackle - This is an interesting product from Laura Geller. "Spackle" is supposed to be her version of a primer. However, this particular kind is more of iridescent hydrating gel. It has the most gorgeous cool toned sheen to it. I love wearing it with dewy finish foundations! NYX "Dewy Finish" Setting Spray - This is a favorite of mine to use with powder products. Anytime I feel as if I've gone too heavy on the powder, I spritz a little bit of this stuff all over my face to revive a healthy looking glow. It gives your skin a soft dewy finish and can be worn on top of, or under makeup! Bourjois "Healthy Mix" Foundation - A new discovery of mine! The Bourjois Healthy Mix Foundation may possibly be one of the best liquid foundations for dry skin. It's so light weight, yet gives an incredible amount of coverage with the most beautiful finish. I'd highly recommend this foundation to anyone with dry skin. You won't be disappointed! Essence Eye Shadow "Sandy Says Hello" - I stumbled upon these one day in Ulta and couldn't believe the amount of shine they had. The shades are so mesmerizing! Each color is packed with a gorgeous shimmering base. At $2.99 a piece, these pots are hidden gems in the drugstore! The Balm "Betty Lou-Manizer" Bronzer - This bronzer has became one of my every day favorites. Like I mentioned, I LOVE luminous products. I know some people prefer matte bronzers but I don't mind if mine has a bit of a sheen to it. This particular shade gives the most gorgeous bronze glow and is perfect for the summer months! Becca Shimmering Skin Perfector "Opal" - This is one of those products that the camera really can't do justice for. The next time you stop by your local Sephora, take a look at this shade and you'll be floored! It has the most unique highlight color I think I've ever seen. "Opal" is a new find for me. 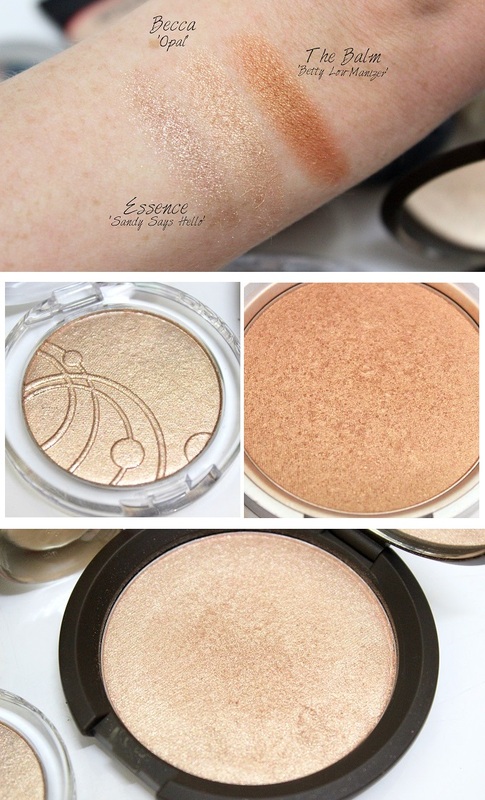 I'ts so beautiful that I find myself opening it up and swatching it just for fun (confessions of a true addict here) It's not too shimmery and adds the perfect hint of glow to your skin! I think I want to try the Balm Mary Lou Manizer and the essence eyeshadow looks really nice! Great suggestions. Where did you find the Healthy Mix foundation? I've been looking for that for years but haven't been able to find it anywhere in the US. I found one place that sold it online, but ordering foundation online scares me - too many color match fails for me. ASOS.com - the color selection is pretty easy!